This edition has been newly prepared from the earliest surviving printed editions of 1593 and 1604, and includes a new introduction, textual notes, and an appendix of related materials. 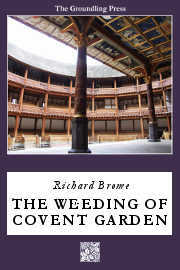 From Richard Brome, master of the new seventeenth century "city comedy," comes this wild story of disguised parents, scheming children, drunken Puritans and swordfighting prostitutes, all living in the new and controversial neighborhood of Covent Garden. The true, though well-embellished, story of the seventeenth-century English celebrity pirate, John Ward, later Yusuf Rais, who shocked Jacobean England by converting to Islam in 1608. This edition has been newly prepared from the only surviving edition, a quarto published in 1612, and includes a new introduction, textual notes, and an appendix of related materials. This fifteenth-century play follows the formal conventions of the morality play, but the bawdy, irreverent battle between its virtues and vices anticipates the secular Elizabethan comedies that followed.